Turns Out The Porsche 911 GT2 RS Actually Can Do Donuts! Contrary to what its debut run at the Goodwood Festival of Speed showed us. It’s unfortunate that the most powerful Porsche 911 to ever debut fell flat on its face during its first bout of public hoonage. That’s not Porsche’s fault, blame the driver for failing to pull off a donut in such a shameful manner that the crowd was left with mouths agape, one member even booing the failed stunt. The driver has few excuses for such a drastic fail, but they do at least deserve some compassion. After all, who wouldn’t be a bit nervous about getting on the throttle when you know 700 horsepower is being sent to the GT2 RS’ rear wheels? That’s more than enough power to pull off a more humiliating move: crashing the supercar in front of the entire Goodwood audience like one poor Ferrari driver did. The anti-climatic donut bout did, however, leave us wondering what the 911 GT2 RS actually looks like when doing donuts. This is the Internet age, so did you really expect it to take us that long to find out? 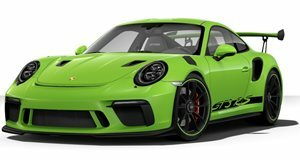 Hopefully not, because just a short while after the failed donut experiment, the 911 GT2 RS got back to it again, turbos spooling and hissing appropriately as the 3.8-liter twin-turbo flat-six engine uses its gargantuan power output to lay down stripes on the road. Turn up the volume and spare no sympathy for those tires because there are worse ways to leave this world than by being sublimated by a $294,250 Porsche supercar.